Elevate Business - Elevation Co.
People are at the heart of every business and they are by nature emotional beings, each with their own drive and sense of purpose. It’s identifying the individual’s purpose and harnessing their emotional capacity that is at the core of our work, and has businesses report an increase in cooperation, cohesion and productivity that was previously not thought possible. While most workplace change and leadership development specialists seek to have everyone ‘on the same page’, our fundamental belief is that this ‘same page’ philosophy is a fast track to the death of innovation and true personal and business growth. What is sought instead is for each person to understand their own unique ‘page’ and how this contributes to the overall growth, cohesion and productivity of the business. Working to each individual’s unique inspiration and engaging them through what they find meaningful and rewarding is key! In a time defined by ever increasing levels of competition, changeable market forces, global trade and technological impacts, it has never been so important to invest in what allows your business to stand out from the crowd – your people! The untapped gold in your business is the people and engaging them as unique individuals is a crucial component which many businesses overlook, ultimately limiting their invention, innovation and growth. In essence, our focus is on building the Emotional Productivity™ in your business. Challenging economic times invite businesses to look beyond traditional productivity measures and improvements. We work with those businesses and organizations who recognize this untapped gold and commit to the development of their people. The new era calls for strong leadership that focusses on understanding people as unique individuals and engaging them in accordance with their values, inspirations and personal legacy and braiding this with the mission, values and legacy of the business. Only by engaging and serving both will the business become fashioned by a culture of learning, innovation, positive risk taking and an organic ability to identify and ride the wave of change – or possibly even define the wave! Business is made up of people and people are driven and inspired by their values. Each and every one of us has different values and the key is to build business infrastructure that recognises and embraces these differences. Values based leadership is the fast track to putting your people and thus business in flow and powerfully impacting the growth of both. Supporting your people firstly to understand and then work and live in alignment with their values will enable far greater experiences of satisfaction, fulfilment and inspiration. This then creates the basis upon which you build a strong business culture. Heather and her team’s work is incredibly powerful in creating change! She has a very fresh perspective on how we as human beings work – within ourselves, in our families and in our businesses. The result of our work with Heather is a stronger sense of clarity about the leadership of the business, a new paradigm of thinking about how to inspire the people who work for and with us, as well as an increased sense of innovation and resilience in creating new opportunities. She is an incredibly talented facilitator who has amazing capacity to reach into people’s fears and struggles and find the lesson or learning that releases the fear and replaces it with inspiration! I strongly recommend you engage Heather and her team if you are serious about being a strong and dynamic leader and committed to building the human capital in your business. Our Business Consulting services specialize in helping businesses and organizations – both large and small – GROW. By helping the people within your company grow and expand their own capacity and productivity, the business or organization as a whole grows. This facilitates a stronger level of engagement and relationships with customers and enhances customer loyalty and personal referral, which is the most powerful form of referral available to support business growth and expansion. Our Business Consulting Services build your businesses’ Emotional Productivity™, which is the cornerstone of innovative business excellence and allows you to cultivate, maximize and harmonize the drive and capacity of every person in your business or organization. This in turn creates greater levels of inspiration and trust, which are crucial in supporting the engagement of the people who make up the businesses. The most positive business culture is built from braiding together individual endeavor and business endeavor, such that the businesses evolution is founded on the unique and natural drive and inspiration in each member of the team. This generates an innovative and cohesive business culture, based on trust and relationships, which exudes an energy of “attraction” for customers – existing and new. Values Based Leadership Framework: research clearly demonstrates that people who know their highest values and build their business and life in alignment with those values, experience the highest levels of contentment, growth and success. Therefore, the foundation of our Values Based Leadership framework focusses on helping people explore and understand their highest values. The Values Based Leadership Ladder™ is the primary tool used to assist clients to map how effectively they work in accordance with their individual, team and business values. Knowing your Big Why: understanding the essential energy and values that drive each person and team so as to determine the most effective way to engage their interest, motivation, and sense of accomplishment. Teaching team members how to identify and speak to this with customers, so as to increase customer engagement and satisfaction. Values Exploration: exploring individual values and aligning individual and team activities to enhance personal and team responsibility and accountability, as well as increasing individual levels of engagement and satisfaction, all of which add to a positive culture and stronger business bottom-line growth. Effective Communication: considering the natural styles of communication and decision making of each member of the team to ensure the development of team cohesion, co-operative endeavor and the development of trust, within and between teams and ultimately with customers. Infrastructure development: reviewing the effectiveness of existing recruitment and “people development” process within the business and ensuring these are built around a values-based philosophy, to ensure the natural “fit” between individual endeavor and business outcomes. Delivery Model: the services of The Elevation Company are tailored to meet the unique requirements and context of each business with whom we work. This involves initial discussion to ensure we understand the unique strategic goals, intentions, opportunities and challenges of your business, industry and economic and social context. This process also enrols “key persons of influence” (KPI’s) within the business who will support the implementation of training and development and lead the ongoing sustainability of the changes made. The delivery of our services can also be structured into phases of work, which builds in accountability and success measurement to ensure the intended outcomes are achieved at each strategic point in the process. All of our consulting services include a component of measurement to ensure you achieve the desired outcomes from our work with your business. Design of the “measurement matrix” is done in consultation with you and your team to ensure it honours and fits with the strategic directions of the business. This matrix then remains within the business to be utilised to measure ongoing development of your business, and the appropriate training required to use it effectively is provided as part of our work. Ultimately, our intention is to ensure the capacity is developed within your business to sustain the changes made with our support and to drive future development without our involvement wherever possible. Executive Coaching recognizes that the “fish swims from the head down” and therefore the effectiveness of the leadership of the business or organization significantly defines the manner in which all others engage (or not) in the business or organization’s endeavor. The Executive Coaching programme provides a Values Based Framework that assists business leaders to understand their own individual leadership style and therefore, how best to understand that in the members of their team, leading to increased levels of engagement, personal responsibility and accountability and increased productivity. This service builds courageous leaders who naturally “inspire” their teams with an energy of attraction, rather than “motivating” their teams. Why are you in business or a career if not to make a difference to your life, to those you love and indeed, to the world around you? So, what happens if the shine wears off it, when the fun goes out of it, and suddenly it’s tough to motivate yourself to just show up? What once inspired you and lit the flame of your enthusiasm slowly becomes a burden on your soul and a place you may not even want to go. On the other hand you may be one of those people who feels inspired and looks for incredible opportunities to learn, grow and be a better version of yourself and make a bigger impact in the world. In either case, it comes down to your ability to know and stand in the power of you. 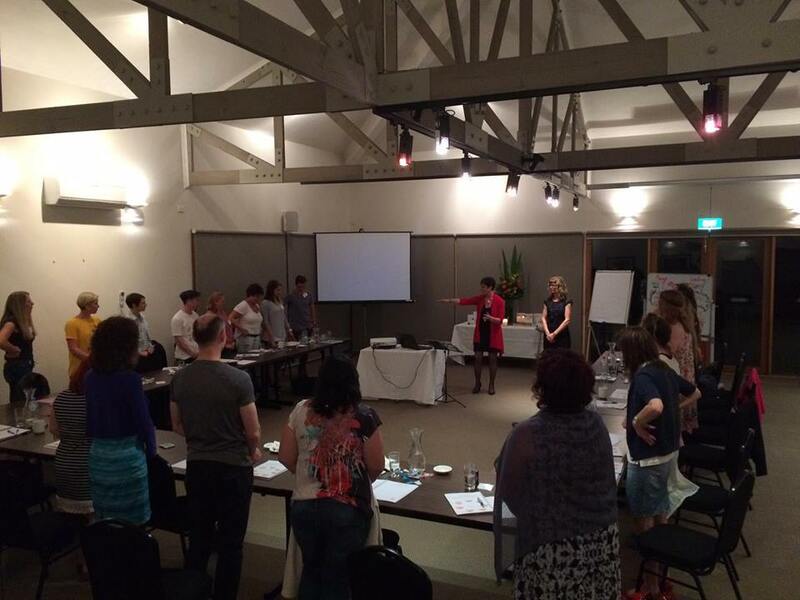 Heather is a renowned international speaker who has travelled around the world sharing her message with audiences on four of the seven continents and was head hunted by one of the world’s leading speaker trainers to deliver Speaker Training for small to medium businesses throughout Australia and the UK. Heather can engage the audience, from small groups to 2,000, and have each person feel as though she is speaking only to them, which contributes to her success in having people not only feel inspired, but actually take action and create positive personal and business outcomes. This ability to engage audiences of any size and in any context makes Heather a powerful and impacting speaker for workshops, training, and retreats as well as larger conferences and summits. She is also a much sought after Master of Ceremonies because of her ability to engage participants, shine the light on speakers and other contributors and braid things together to create unexpected flow in the event and thus, stimulate learning and action in the audience. I am a big fan of Heather’s work and the depth of her knowledge in her field. In fact, one day I gave Heather an hour’s notice to cover a speaking gig when another speaker had to withdraw due to illness and not only did she cover it for me, she won the heart of the promoters and participants alike with the level of power and engagement in her presentation….and that was without PowerPoints, whiteboards or flip charts. A true professional. Heather has spoken for Motivational Speakers International, Clariden Global, Shift Speaker Training (Australia and UK), Origin Australia, Klass Events, Roger Hamilton and Wealth Dynamics, Logistics Bureau, The Growth Project, Real Estate Results Network (Australia and Fiji), James Family (NZ), the Mars Company (NZ), the Publicity Princess Media Training, and at over 100 other events in a Key Note capacity. The Millionaire Books series features Heather as a contributor to the Millionaire Coach book, providing insights into how to “achieve a millionaire mindset”. Heather has also been interviewed by and featured in some of Australia and New Zealand’s leading media outlets, including Channel 7’s Sunrise programme, Channel 9’s Today show, Channel 10’s The Project, ABC Radio National, TVNZ 7 Breakfast show, Radio New Zealand National, Cleo, Melbourne Talk Radio, The Age, The Age GoodWeekend, The Herald Sun, Body and Soul and Insight Magazine. You know when you meet someone who is going to impact your life very deeply! Heather has a wisdom that is absolutely undeniable. The journey she takes people on when she speaks is extraordinary. Heather, thank you for the gift you are to the world. In the modern era of business, trust is viewed as the primary currency of trade. It is the key to attracting and keeping great people and customers alike. It is also the key ingredient to creating lifelong customers who in turn become powerful exponents of the work you do and the difference you and your business make in the world. 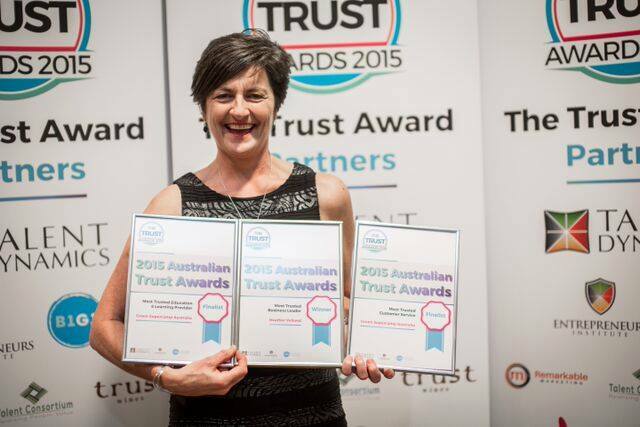 Heather was recently voted the Most Trusted Australian Business Leader in the Australian Trust Awards. She and the team at The Elevation Company were also finalists in two other categories – Most Trusted Learning and Education Provider and Most Trusted Customer Service. Heather has also been a Nominee in the “NAB Women’s Agenda Leadership Awards” for the last three years. If you’d like to know more about any of our services to Businesses or Executives, please connect with us and someone from our team will contact you.